For quite some time I've had a poll running on the blog asking what you feel is the hardest hole on the golf course. As you can see it is without question the majority of you feel it is the 8th hole. This isn't too surprising. #8 at Tacoma is simply a beast. It's long, narrow off the tee, uphill on the approach and the putting surface is smallish and undulated. Three of you felt #4 was the hardest hole. This hole got much more difficult following the recent renovation and I'm kind of surprised more of you didn't choose it as the most difficult. Three of you felt #14 was the hardest hole and finally only one of you voted for #1 as the most difficult. I find the results of the poll interesting but since only 27 people voted, it's safe to say that the results aren't necessarily conclusive. So what is the hardest hole at Tacoma? I think the answer is it depends on who your asking. Everyone has their nemesis. If you can hit your driver really far, #8 might not be the hardest hole for you. On the other hand if you can't hit a fade with the driver, #8 might be very hard for you. This is one of the most beautiful things about the game. We all play golf differently and each hole requires a strategy which may or may not favor our individual type of play. 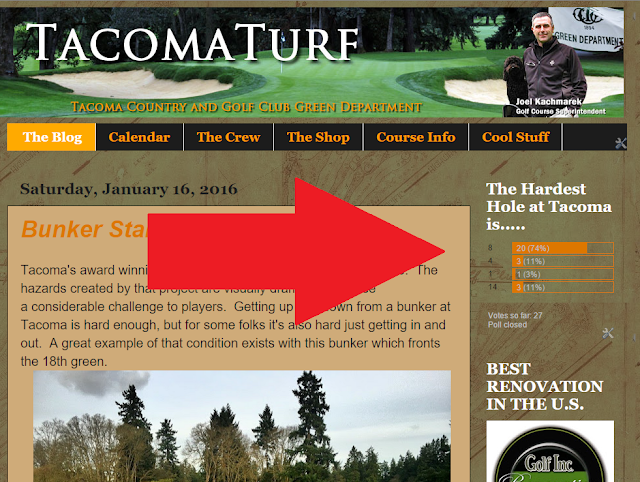 With that said you might find it interesting which hole at Tacoma plays statistically "the most difficult". To do this we can look at how each hole plays in relation to par over a period of time with a large field of players that are close to equal in skill level. Lucky for us this type of data is easily accessible since last fall we had the honor of hosting the Pat Lesser Harbottle Invitational. That event was contested by 88 collegiate golfers each of who played 3 rounds. I averaged how each hole played in relation to par over the 3 days of play and this is what I found. Number 8 was the second hardest hole. The stroke average was 4.7 on the final day of the event. Believe it or not #12 was the third hardest hole. On the first day of the event, this hole was the second hardest hole just behind #1. Number 4 was the 4th hardest hole. Number 14 was the next hardest hole. At 328 yards its easy to overlook this short hole but there are not many places you can hit it off the tee and have a good look at the green. Following is how all 18 holes played in the Pat Lesser Harbottle Invitational in order of hardest to easiest. 1, 8, 12, 4, 14, 11, 7, 2, 3, 10, 17, 13, 5, 6, 9, 18, 15, 16. I look at that listing and it tells me something that every Tacoma member already knows. First of all the front nine is hard. 6 of the 9 hardest holes are on the front side. Secondly, you always have a chance to salvage a bad round. 3 of the easiest holes on the course are in the home stretch.